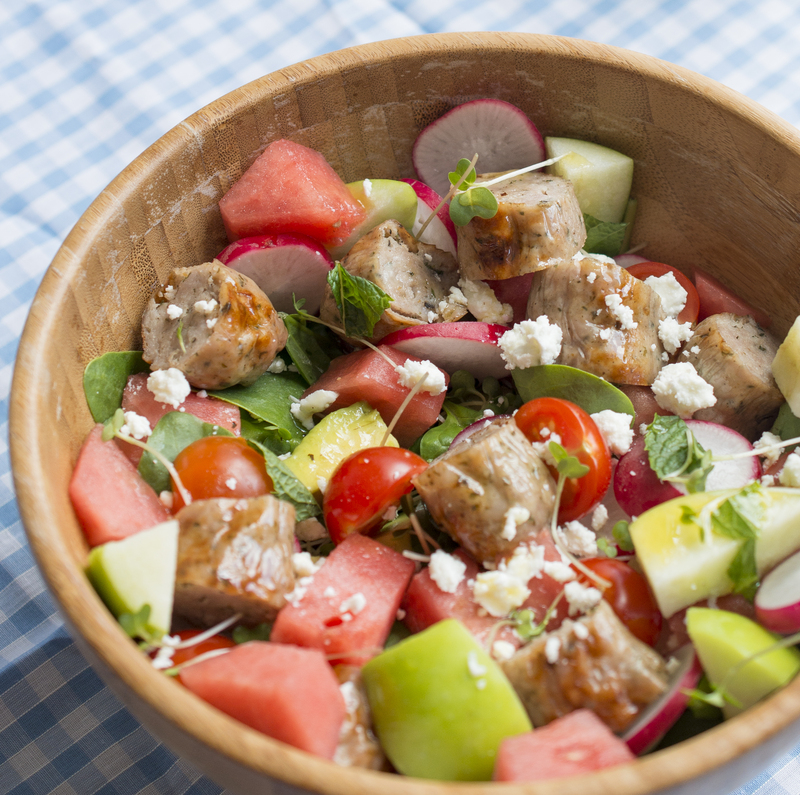 Recently I teamed up with Debbie&Andrew’s to create a fresh, Summer salad using their sausages, specifically their ‘Clean & Lean Pork Sausages’. These sausages are very high in protein (25 grams to be exact!) so they’re perfect for mixing into your fitness and muscle-building diet. 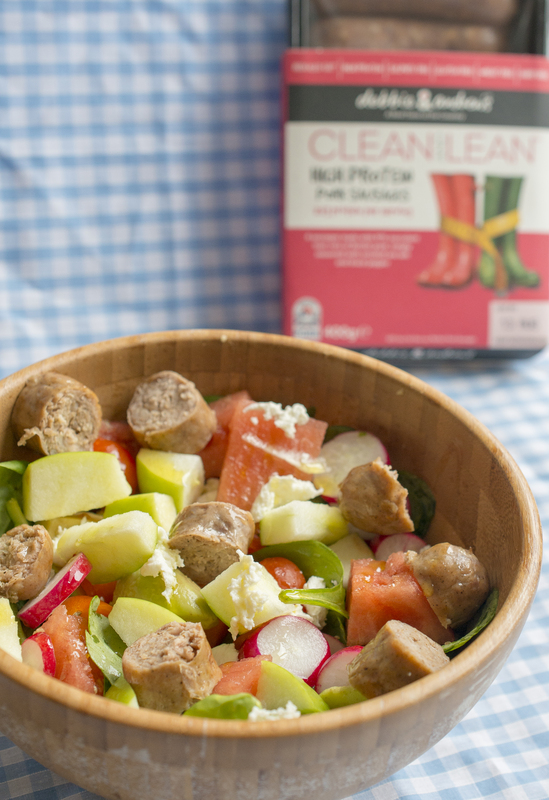 What I particularly enjoyed about working with these sausages as the main ingredient of this salad recipe was that they had that meaty flavour and weren’t mixed with many other ingredients just to ‘bulk out’ the sausage. Their whole range of sausages taste great though. I also tried their ‘Perfect Pork’ sausages and they had so much flavour! What I like about this recipe is that it’s well-balanced for the Summer. It’s light, fresh and combination of sweetness from the fruit goes really well with the meatiness of the sausages. Anyway I hope you all like it. Feel free to send me your feedback as always and enjoy! Once the grill is hot enough add the sausages and cook for 15 minutes, turning occasionally. Meanwhile prepare the remaining ingredients and place into a large enough salad bowl. Next add the dressing ingredients into a jug and whisk together to combine. Season with salt & pepper to taste. 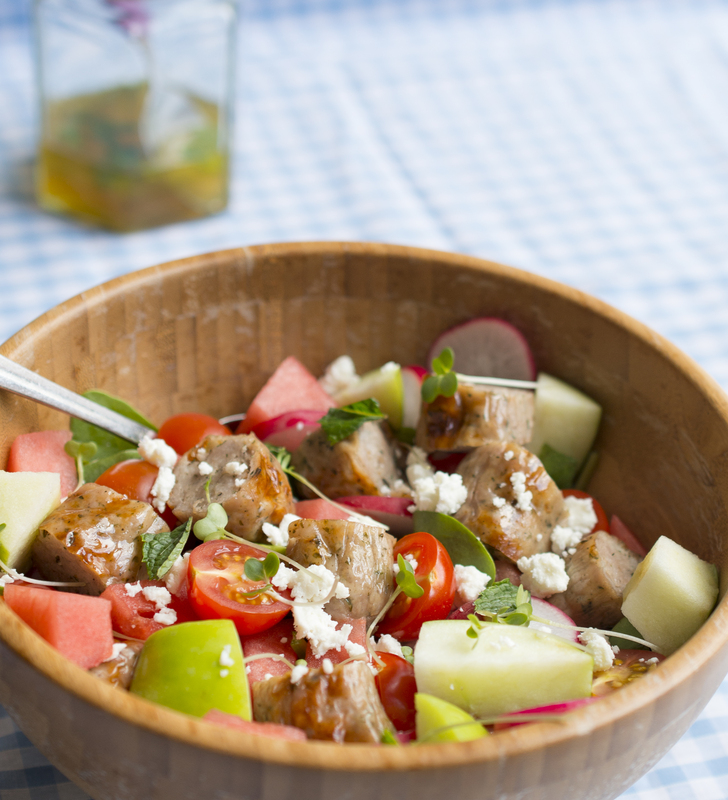 Once the sausages are cooked through slice them into chunks and add them to the salad bowl. Pour the dressing over the salad and toss to ensure everything is fully dressed, then serve. Disclaimer – A commission was received for writing this recipe and sharing it with you guys. All views and opinions expressed are my own.